Please come and join us for this year’s JACK ROLLINS SUPERHERO 5K. 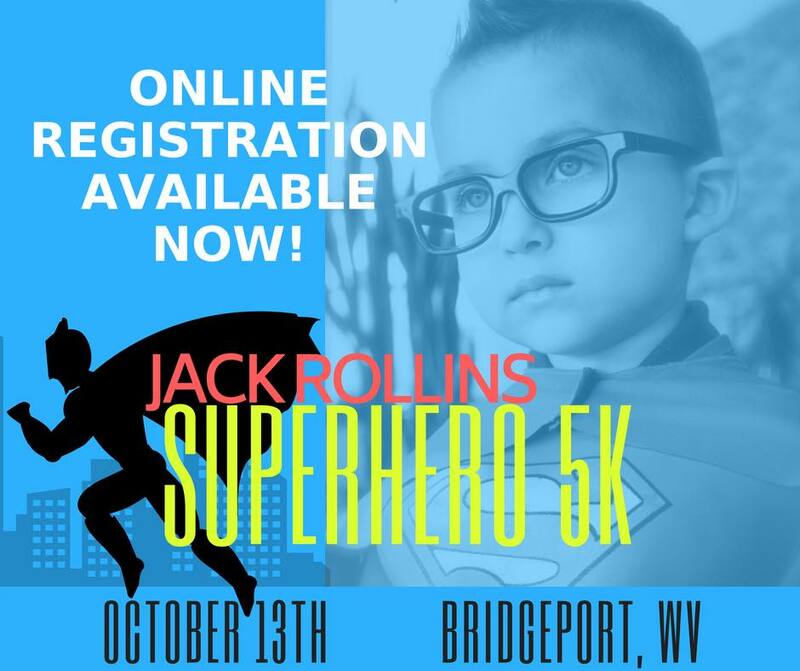 The race is held to honor our Superhero Jack, and to raise funds for the foundation that was established in his memory, The Jack Strong Foundation. The race will be held on October 13th in Bridgeport, WV. Immediately following the 5k, we will have a Kid’s Fun Run for children 12 and under. Superhero Obstacle Course, Face Painting, Temporary Tattoos, Raffle Items, and Food Trucks. Come out and join us, and meet a few of your favorite Superheroes! The first 100 racers to pre-register, will receive a free t-shirt and goodie bag. Want to get a good healthy meal and support a great cause at the same time? Then come out to Panera Bread in Clarksburg, WV on Thursday April 26th 4:00pm-8:00pm and support The Jack Strong Foundation. Panera will be donating a portion of the proceeds to The Jack Strong Foundation for anyone who brings in the flyer below (paper or electronic version). Put on your favorite SUPERHERO shirt, cape, or costume and bring your family out for dinner at Buffalo Wild Wings in Bridgeport, WV. A portion from the sales will be donated to The Jack Strong Foundation. Order your Texas Roadhouse Rolls, Butter & Peanuts Today! Buti Yoga transforms your Body + Soul in a sustainable way. Fall in LOVE with your workout. Buti Yoga is not just a workout, it's a chance to let go and sweat with intention. This calorie-scorching class fuses power yoga with tribal dance and body sculpting movement. Be BRAVE with your life and join us for an amazing cause!